This project required the removal of 198,000 CY to a depth of -8’ MLLW with a completion date of 128 days after NTP. This project’s complexity, high volume, and short timeline to completion required Burnham Associates, Inc. (BAI) to enter a Joint Venture with Cashman Dredging and Marine Construction (CDMC) in order to pool assets and allow for successful, timely completion. 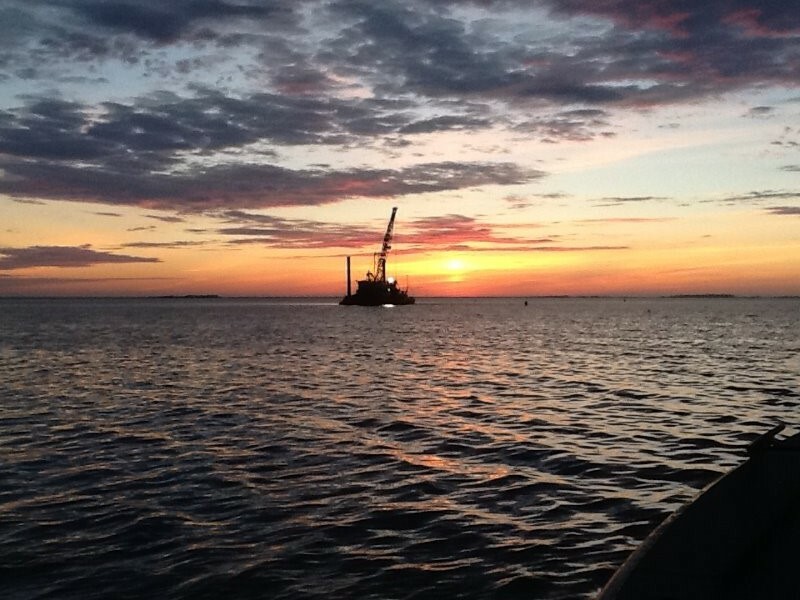 BAI’s smaller, more accurate dredge equipment lent itself to the more technically challenging dredging of the heavily shoaled entrance channel to Duxbury Anchorage. The BAI dredge SAMSON 3 was mobilized onsite along with our two 2,000 CY bottom dump scows SE103 and SE104. The channel, beyond its narrow width and heavy shoals, presented a further challenge by requiring both a 6 CY Anvil heavy digging bucket for areas of hardpack sand and a 9 CY Cable Arm sealed environmental bucket for much softer silt further into the channel. This required the removal of approximately 6,000 CY of material in the channel, sometimes with <1’ of face above clearance depth requiring removal. Timely completion of this phase was imperative as the mobilization of CDMC’s dredge was contingent upon successful clearance of the entrance channel. Upon completion of this phase of the project, the now cleared channel allowed CDMC’s larger dredge to enter the anchorage and begin to remove heavy amounts of soft silty material that had filled the anchorage over many years. Effective coordination between both dredge plants and their attendant towing vessels ensured successful completion of the project on schedule and on budget.